When it comes to Halloween, I typically decorate in the "harvest" fashion as opposed to the "horror" fashion. Meaning: I'd rather have pumpkins and fall leaves around the house, not bloody body parts and skeleton bones. However, page 2 of my silhouette pumpkin transfers I picked up from my BFF Martha contained a couple dozen BUGS! What was in the world was I going to do with these? I decided to make a mini-specimen table using the paper bugs and plastic spiders I already had. The idea came by accidentally placing the plastic lid to an ornament container over one of the spiders - it instantly resembled a lab petri dish! I played around with the other transparent containers I had and think the 6 piece votive candle lid worked splendidly to show off a bunch of the little guys. A few escaped bugs and spiders creep around the table and up a white candle (displaced from its usual dining room centerpiece by a bunch of gourds). If you are looking at the photos throughout this post and saying, "hey these don't exactly fit together. . ." it's because I was taking pictures while I was still in process so some items ended up getting shifted around. Like, replacing the cat-face bucket full of wine corks with the decorated candle. I honestly can't remember where this mini-mummy came from - some sort of shrinky dink. His natural "put your hands up" pose and frightened eyes made him perfect to glue against a cylindrical cell. Trapped with over-sized insects, poor little guy! The whole crew sits on a white tray from CB2 I stole from our bedroom organization table. I thought I might be able to use some dark fabric underneath at first, but the stark white of the table really helped to add to the "Lab Vibe." Martha uses the same bug motif for some of her Halloween-themed paper and I made sure to snag a 5x7 piece from my sister's collection. The page fits into an unused photo frame that went up with sticky Command strips to finish the scene. Rounding out the table is a wine bottle we already owned that happened to have a spooky label - the scene does sit atop our wine cabinet after all - and a hurricane filled with "eyeball" chocolates. The candle and white rocks in the hurricane helps fill the inside space and make it look fuller. Of course, Bob keeps stealing a few here and there so it is slowly going down. Or maybe it's the work of a ghost. . . 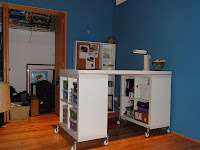 In another part of the living room, I re-employed a trick from last year that I learned from younghouselove.com. Take the dust jackets off books with ominous titles and stack them up. So here we have my little costumed kitty sitting atop Sin in the Second City, Hannibal Rising and Midnight in the Garden of Good and Evil. I also had a random piece of witchy fabric leftover from a quilt my aunt made that I stuck in a frame. So there's how I spookified my house, if just a little bit, this year! What types of decor do you like best?